My minor victory this month is having finished the binding on this quilt. Very pleased that it is complete and I can show it to you. I named it "Sacred Heart" and it measures 59" x 59". That square in the center was pieced by my late grandmother, Mary Ann Cameli. She made it during a little sewing date we had during a visit I made home. I found it (and two others from that day) on her design wall when I returned home for her funeral. I took those blocks home and I built the rest of this quilt around my favorite. My grandma had a fascination with Catholic folk art. The inspiration for this quilt is taken from the many "sacred heart" pieces she had purchased from artisans over the years and displayed on her walls. Up close I think that comes through the clearest. The quilting within each wedge is very regular, geometric, giving way at the transition to the background to less orderly, more organic forms. 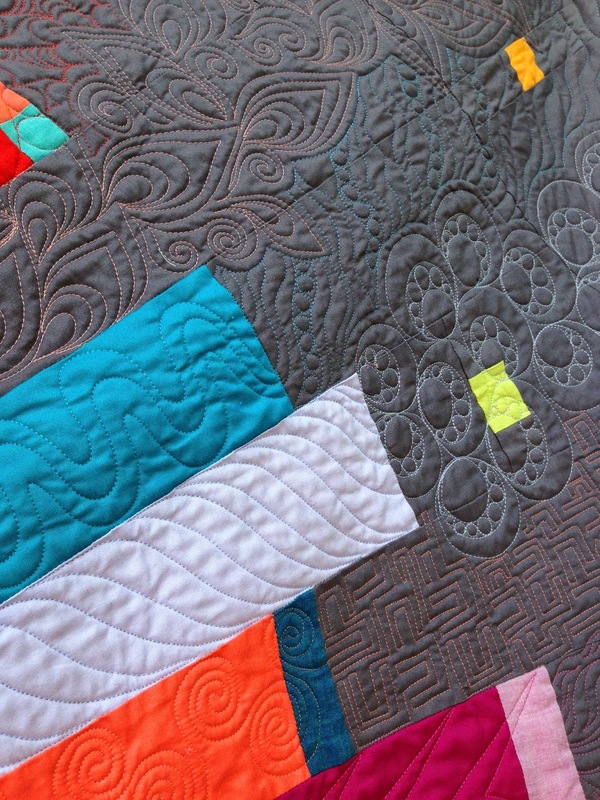 Lots of my new designs in this quilt, spilling against each other in all that open space. The whole quilt brings in me a sense of contentment. I worked on it in a state of uncommon grace, without getting stuck in ambivalence or self-consciousness. Often artists talk about feeling like the work comes through them, that they are the conduit rather than the source. That is how I felt. That's for me the feeling that distinguishes art from design for me. Design begins and ends with me. But when the work is bigger than me, when my part is letting it come out, that's art. Side note: if you are an artist and haven't seen Elizabeth Gilbert's TED talk on creative genius, give yourself a 20 minute vacation and check it out. So that's my great work of late. I know my grandma would have loved it. I want to enter it into a quilt show, which will be a first for me. And a first for my grandma too. Isn't life always full of surprises? Wow, this is incredible! And what a great way to honor your grandmother. This piece is stunningly beautiful in every way! BRAVO!!!! AMAZING quilt and beautiful, heartfelt story! Love it SO much ~~ especially that it is a combination of you and your grandmother! HOw beautiful! What a wonderful tribute to your Grandma. The story that goes with this quilt just makes it all the more beautiful. 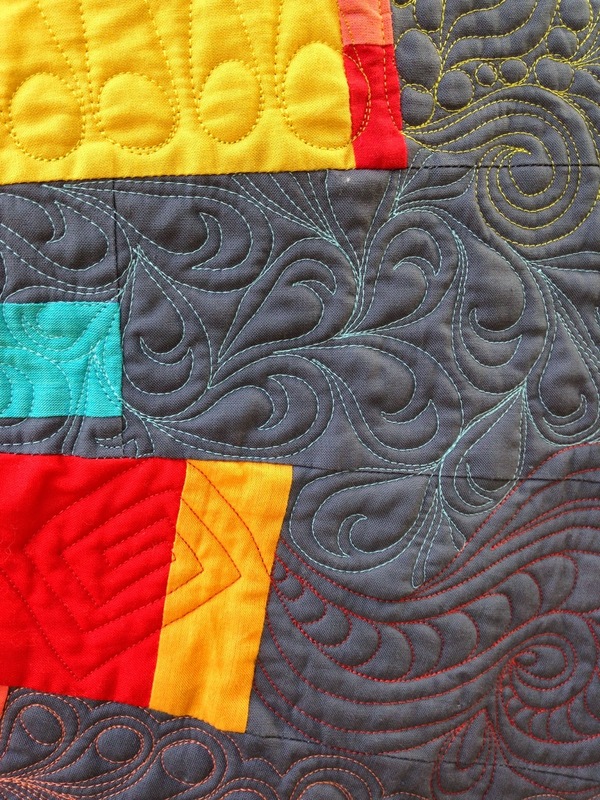 Your different quilting motifs work beautifully together - it could've looked chaotic but it doesn't. So many congratulations on this fantastic oeuvre. I love how the quilt evolved from a day spent with your grandmother. Terrific story and awesome quilt! Your grandmother would be SO proud of her very talented and artistic granddaughter! This beautiful quilt is a fitting tribute to her and the special relationship you had with her! Bravo girlfriend. I just love this thing and the story behind it! 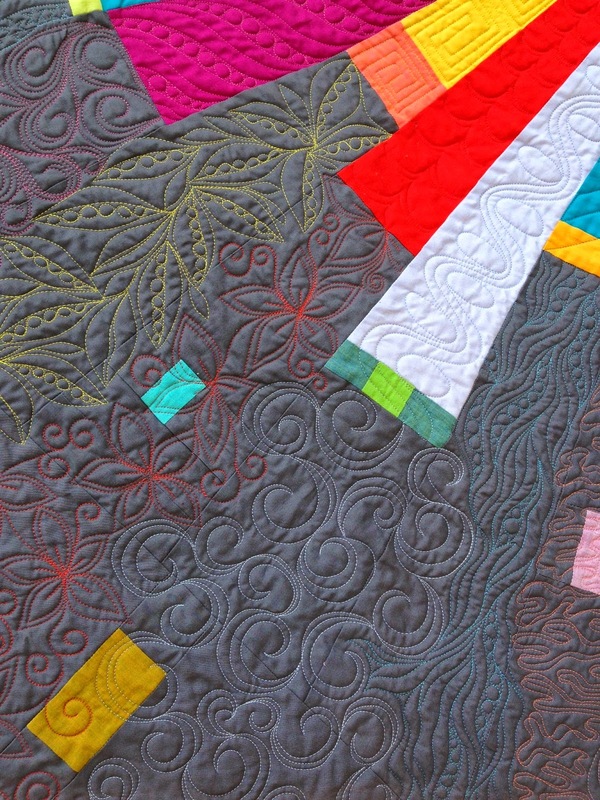 Wonderful evolution and story-- and the quilt and quilting are so fab!!! you've brought tears to my eyes. What a wonderful way to honor your grandmother. Beautiful quilt, congratulations. It is beautiful Christina. I know that feeling of the work coming through you. I believe that my best work comes that way. I look back at those pieces in amazement wondering how I did it. Your Grandma would be thrilled with this - what a tribute to her! I just love all your different quilting designs - what an inspiration to those of us who are quilting on our home sewing machines and doing our best to make pretty quilts. What a beautiful thing to be able to use your grandmother's block as the "heart" of your quilt! And the quilting is gorgeous -- what a fantastic job you've done. Thanks for sharing. Beautiful, Christina! Your quilt sings with the joy you shared with your grandmother. This, I truly believe, is what can happen when we open our hearts and minds to the infinite possibilities of love of family and friends. She was with you every stitch of the way, from her block to the final quilting and binding. Thank you for sharing. Love your quilt and its inspiration! I already thought this quilt is beautiful and with the story it is even more so ~ what a wonderful tribute to your Grandmother! I've also felt that grace you wrote about. When I was doing stained glass full time, I'd be able to work for hours that felt like minutes and always be amazed at the work I did ~ I'd think 'who did that?'. I'll have to share the Sacred Heart I made some years ago with you. You always come from the heart ~ thank you for the inspiration! It is beautiful. Grandmother is smiling up in Heaven. Oh my goodness, it's incredible! I have no words . . . except "ole ole"! 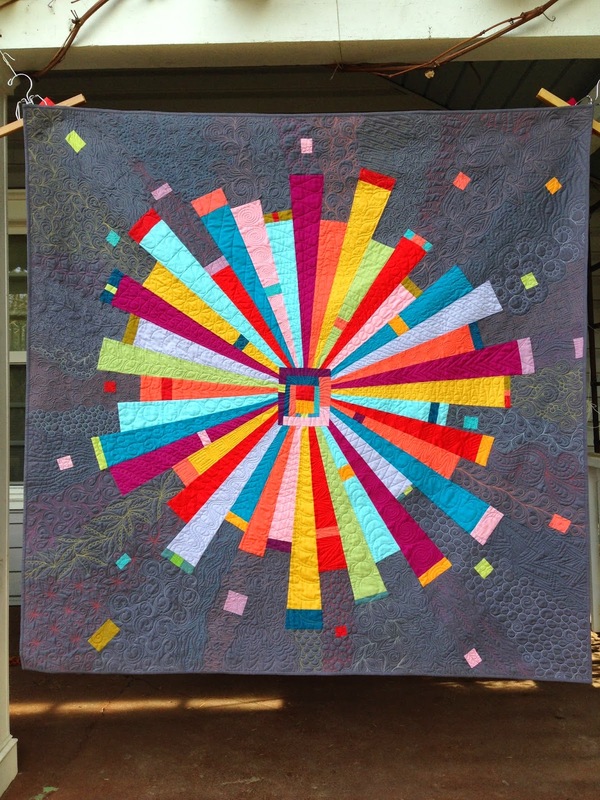 I love the story behind your quilt and it's beautiful! Absolutely wonderful. I'm sure the work coming through you started with the centre block of grandmas and the special meaning that has. She would be so proud and how wonderful that they were there on the design wall 'waiting for you' What a treasure to now how and good luck for when you enter it in a show. Great quilt. A bit of both of you. That makes it even more special. 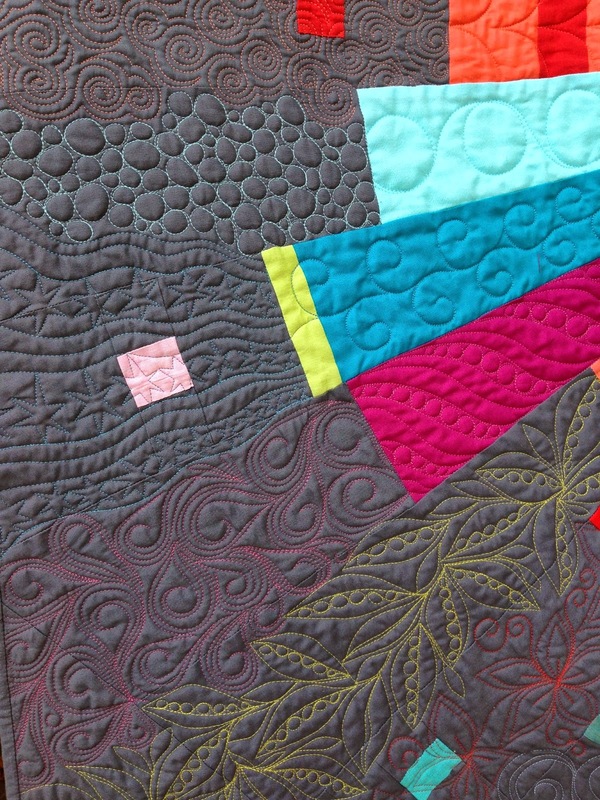 Hey, I've sent someone to your site for tips and tricks for free motion quilting (since I'm not good at it, but, you are great at it). 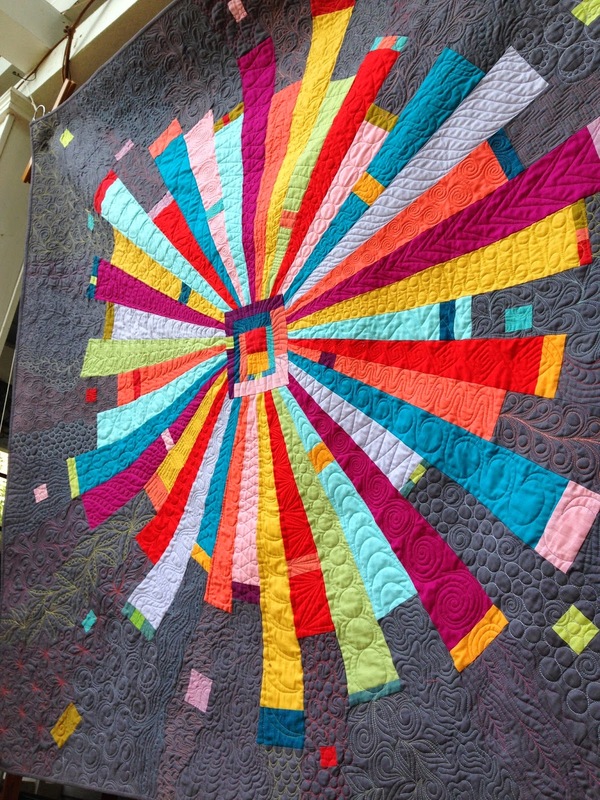 What a beautiful quilt and stunning quilting! So beautiful....thanks for sharing your process!! 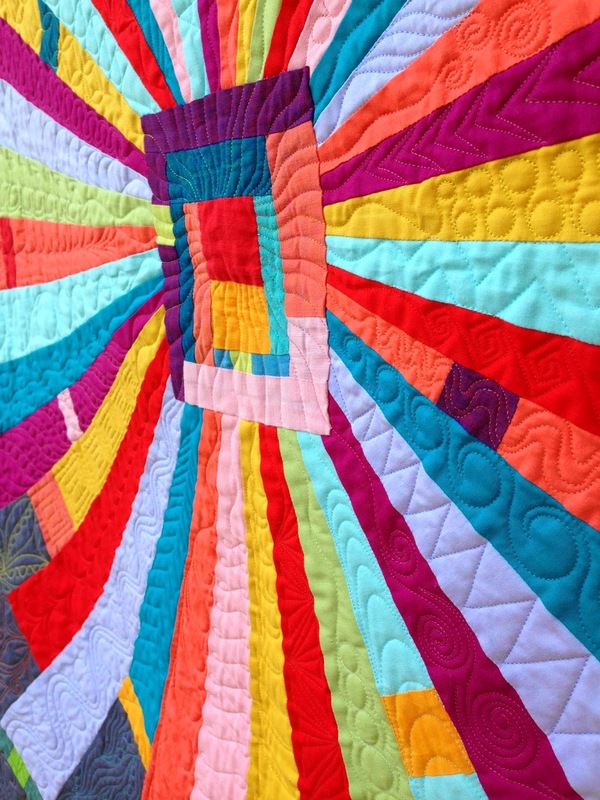 What a vibrant looking quilt! I love it. So much things are going on this quilt. Just so lovely. The quilting on this piece is spectacular. Thank you for sharing it. Hope you have submit it to a show as its a winner for sure. Christina; I wish I could express what looking at this quilt does to me (aside from its remarkable and masterful artistry!) - I feel so moved looking at it. The design - its radiances and lovely surprises - the connection between you and your grandmother is obvious. What a tribute! And the quilting and all the colors and your designs are like a beautiful and varied tapestry - a hieroglyphic quilt language of your lives, intertwined into what i call High Art - I'm not saying it well, but that quilt is speaking poetry. The quilting and colors you chose are astounding. There really are no words to do it justice, but it moves me deeply. Thank you for sharing this. Agree you should enter it in shows - it deserves to be seen! Sacred Heart is the perfect title - even if a person didn't know the story, the quilt conveys its essence. I love the abstract geometric depiction of this sacred heart with the organic quilting. Genius came through you - did you feel your Grandmother as you were making it? Such a beautiful quilt, and the name is perfect. What a lovely way to remember and honor your grandmother! 2. 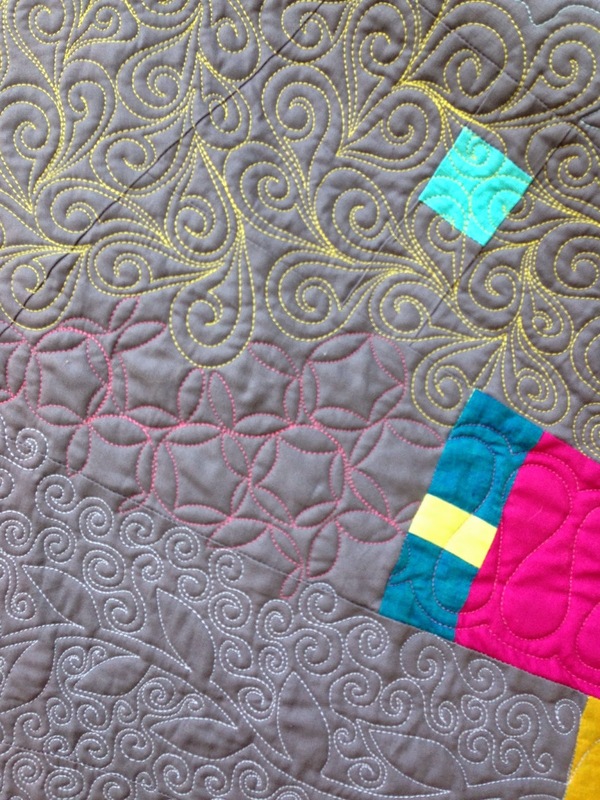 The back story - I love the back story, what a beautiful incorporation into your quilt. 4. 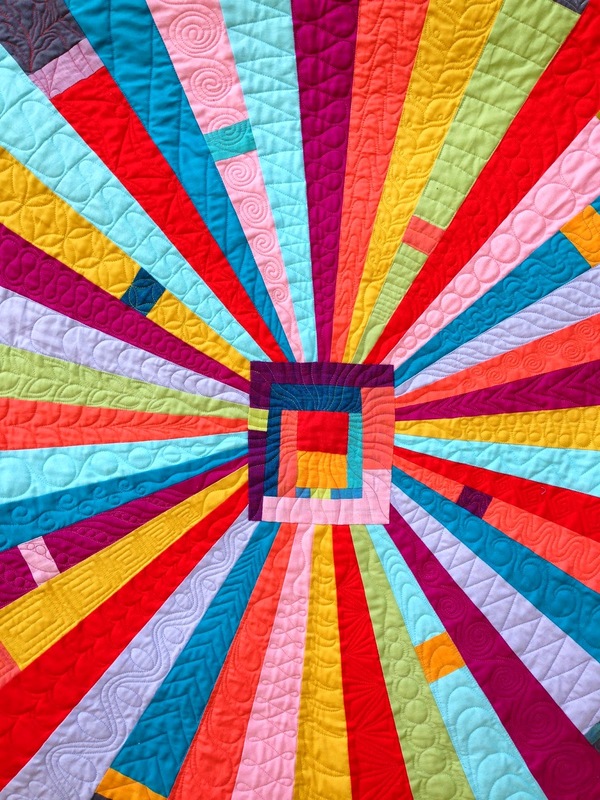 The name - this quilt makes me think of love exploding, expanding or radiating, encompassing all it encounters. So the name, and your nan's block in the middle, makes me think that it is the love she has spread in life, and how it continues to spread through you and through everyone that she has loved througout her life. Wow. The quilt is breathtaking and the story is moving. What a beautiful story. This quilt is precious. And I don't mean that in the cutesy tootsie way... But precious in the irreplaceable and always treasured way. Christina, you wrote how you feel about it so eloquently... My heart understands your words. A Very beautiful tribute to your beloved grandmother! Stunning work of art from the heart! Wonderful - thank you for sharing it with us. Your quilt , I so love it! it seems like an explosion in the cosmos with all the energy of a Sacred Heart that is so apparent in your description of who this is in honor of. My husband died last year and this is how I feel about his spirit in heaven as well, a beautiful sacred heart! Thank you for the wonderful inspiration.